Fetch a book for Urag gro-Shub. Urag gro-Shub wants you to find books for the Arcanaeum. After joining the College of Winterhold, you will find an opportunity to visit the Arcanaeum. Here you will meet the master archivist, Urag gro-Shub. He is very solicitous of his books, threatening bodily harm should any problems arise under his watch. After his blustering, ask Urag if there is any College business you can help with. If you assure him you are feeling adventurous, he will name a book title he would like to procure from a more "dangerous" location. The book will be located in the boss-level chest of any dungeon in the game, and as this is a radiant quest, your destination is randomly selected from over one hundred forty possible dungeons. The book you are asked to find is never a skill book, and the monetary reward you get from Urag for returning a book is very small in proportion to the amount of work required to fetch it. However, this quest is a useful means for locating dungeons in Skyrim. The various loot you find in the dungeons will be considerably more valuable than the book. The two different quest IDs correspond to two nearly identical quests. In particular, the lists of possible books and lists of possible dungeons are the same for both quests. The only difference is Urag's dialogue throughout the quest. If you find the book before activating the quest, you will be stuck with it. The quest will point to the chest, and the book won't be there, and can't be returned. Once this has happened, you will be stuck with any additional copies you pick up as well, even if you activate the quest before getting a second copy. Use player.drop "book ID" "quantity" to drop and retake the book to complete the quest. Alternatively use console player.additem 72841 1 to add quest version of that book to inventory. Then use setstage MGR20 20 to finish that stage of quest. 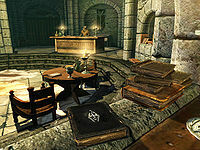 If there is no quest marker pointing you to the book's location, the book may be located in The Katariah, in which case the book can not be reached until the quest Hail Sithis! begins. The quest marker may point to the Thalmor Embassy instead of Shadowgreen Cavern, which is right next door. If you find the book before activating the quest, the quest will point you to Urag gro-Shub saying "Return the book to Urag gro-Shub" (if you have installed the unofficial patches) but Urag gro-Shub will not provide new dialogue thus making it impossible to complete the quest. Use setstage MGR20 200 to finish the quest. (use this if setstage MGR20 20 doesn't work). Use "MGR20B" if "MGR20" doesn't work.